Generates star shaped rainbow colored glints at locations where the Source clip is brighter than the threshold. The colors of the glints are scaled by a Mask input, and then combined with the Back input clip. 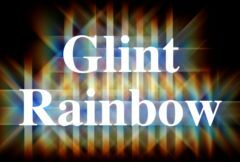 This is similar to GlintRainbow, but here a Mask input is provided, and also the glint source and background can be different clips. Mask: The source glint colors are scaled by this input. A monochrome Mask can be used to choose a subset of Source areas that will generate glints. A color Mask can be used to selectively adjust the glint colors in different regions. The Mask is applied to the source before the glints are generated so it will not clip the resulting glints. Shift Blue: Default: 0.75, Range: 0 or greater, Shared . Shift Red: Default: 1.5, Range: 0 or greater, Shared . Shift Out: Default: 0, Range: any, Shared .